The deaths of 13 U.S. service members in Afghanistan were announced this past week by the Department of Defense. Pfc. 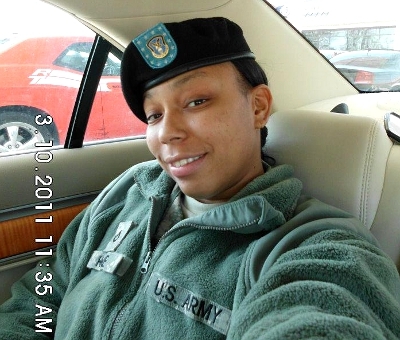 Patricia L. Horne, 20, of Greenwood, Miss., died Aug. 24 in Bagram. She was part of the 96th Aviation Support Battalion, 101st Combat Aviation Brigade, 101st Airborne Division (Air Assault) stationed at Fort Campbell, Ky. The military has not disclosed the cause of death. Horne (pictured above) was only the 37th women in the U.S. forces to die during the 11-year war in Afghanistan. An AP photo shows Horne's flag-draped coffin being carried off a plane at Dover Air Force Base. In the days before she died, Horne was exchanging messages with friends on Facebook, where she had an account at the address LilArmyGirl. Asked how she was doing in Afghanistan, she replied on Aug. 20, "ok so far." A day later she told a friend, "miss you too honey bunches of oats." Horne graduated from Greenwood High School in 2010 and joined the Army that August. Her friend Will Coleman, a fellow member of the Greenwood class of 2010, wrote Saturday on Facebook, "Known this girl for years, one of the closest friends I ever had and she meant so much to me. ... I know I had my ups and downs with her but regardless of all that we were still tight. I really don't know what else i can say at this moment. I'm still in shock over it all." Seven soldiers died Aug. 16 in a UH-60 Black Hawk helicopter crash in the Shah Wali Kot district northeast of Kandahar during a special operations mission in enemy territory: Army Chief Warrant Officers Brian D. Hornsby and Suresh N. A. Krause, Army Sgts. Richard A. Essex and Luis A. Oliver Galbreath, Navy Special Warfare Operator Petty Officer 1st Class Patrick D. Feeks, Navy Special Warfare Operator Petty Officer 2nd Class David J. Warsen and Navy Explosive Ordnance Disposal Petty Officer Technician 1st Class Sean P. Carson. Three members of the Afghan security forces and an Afghan civilian interpreter also were killed in the crash. 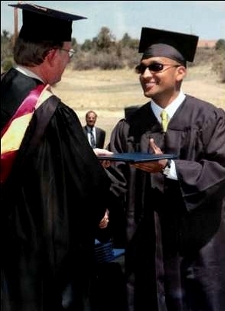 Krause, 29, (pictured at right) was born in Sri Lanka and came to the United States as a 14-year-old boy when he was adopted by Suzie Krause-Schmidt and Brian Schmidt. His biological parents Daya and Yolette Abayasekara followed him to California's Coachella Valley two years later. Nicknamed "Ba" because he was the youngest of three siblings -- the "baby" of the family -- Suresh Krause joined the Army in 2007 and became a Black Hawk pilot two years later. He lived in Cathedral City, Calif., and graduated from Cathedral City High School. Krause's father Brian told TV station KESQ that they liked to duel each other in sessions of air guitar. Brian recalled, "His favorite, 'Don't Let the Sun Go Down on Me' -- he was probably the worst Elton John." Brian knew something was wrong before Army officials arrived at his home, he told NBC Los Angeles. Suresh "checks in right away if there's a crash, to let us know," Brian said. Krause; Hornsby, 37, of Melbourne, Fla.; Essex, 23, of Kelseyville, Calif.; and Galbreath, 41, of San Juan, Puerto Rico; were part of the 2nd Battalion, 25th Aviation Regiment, 25th Combat Aviation Brigade, 25th Infantry Division at Schofield Barracks, Hawaii. Feeks, 28, of Edgewater, Md., and Warsen, 27, of Kentwood, Mich., were members of a Navy SEAL special warfare unit. Carson, 32, of Des Moines, Wash., was assigned to an explosive ordnance disposal mobile unit in San Diego. Army Spc. James A. Justice, 21, of Grover, N.C., died Aug. 17 at Landstuhl Regional Medical Center, Germany, from injuries suffered three days earlier from enemy small-arms fire in Wardak province. Justice was assigned to the 2nd Battalion, 503rd Infantry Regiment, 173rd Airborne Brigade Combat Team, Caserma Ederle in Vicenza, Italy. Marine Staff Sgt. Gregory T. Copes, 36, of Lynch Station, Va., and Navy Hospital Corpsman Petty Officer 1st Class Darrel L. Enos, 36, of Colorado Springs, Colo., died Aug. 17 during combat in Farah province. They served with 3rd Marine Special Operations Battalion in Camp Lejeune, N.C.
Army Sgt. 1st Class Coater B. Debose, 55, of State Line, Miss., died Aug. 19 in Kandahar province when two Afghan policemen reportedly opened fire on coalition troops. Debose was part of the 2nd Battalion, 351st Infantry Regiment, 158th Infantry Brigade, 1st Army Division East at Camp Shelby, Miss. Army Sgt. David V. Williams, 24, of Frederick, Md., died Aug. 18, in Kandahar. He served in the 2nd Battalion, 1st Infantry Regiment, 2nd Stryker Brigade Combat Team, 2nd Infantry Division at Joint Base Lewis-McChord, Wash.
Army Sgt. Louis R. Torres, 23, of Oberlin, Ohio, died Aug. 22, in San Antonio, Texas, of wounds suffered Aug. 6 in an improvised explosive device blast in Kandahar. Torres belonged to 2nd Battalion, 3rd Infantry Regiment, 3rd Stryker Brigade Combat Team at Joint Base Lewis-McChord, Wash.